Your customer’s retail floor is your opportunity! GroundFX! is the ideal solution for delivering fresh retail messages with high-visibility. Turn a retail floor into a billboard! It’s easy! Just send us your electronic file and we do the rest! The GroundFX! system is a full colour, scuff-resistant and fully water-proof decal engineered for application on tile, terrazzo, concrete or wood floors. It is durable, but easily removed without residue when your customer’s promotion is over! Get the advantage of a fully insured, UL Classified floor graphic system! 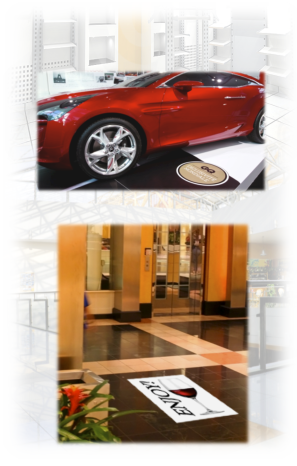 Now you and your clients can have peace of mind whenever you implement a new floor graphic promotion. Our GroundFX! product is UL Classified and guaranteed slip resistant. But that’s not all! Grovetree carries a Peace-of-Mind insurance policy that covers you with $2,000,000. indemnification against claims for damages from slipping and falling. With GroundFX there’s no worry! GroundFX offers single-source responsibility; just relax – we do it all for you!